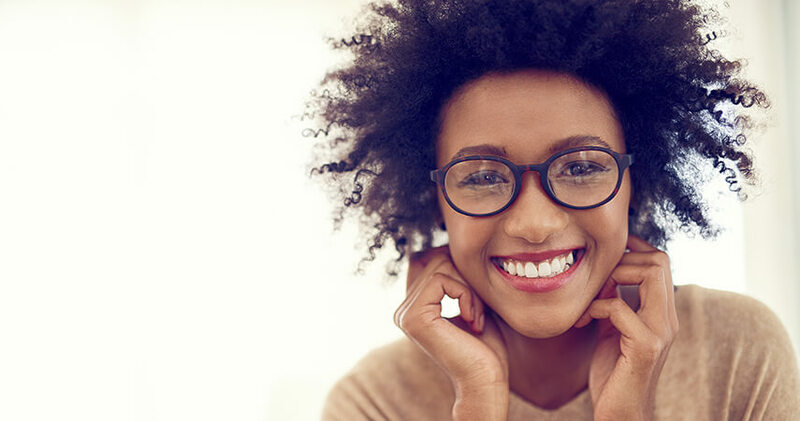 When you start wearing glasses, it’s best to re-evaluate your beauty routine and switch things up to accommodate your new frames. If you’re not careful, your glasses can detract from your eyes. Instead, make your eyes pop by ensuring your frames enhance your eyes instead of hiding them. We’ve got some great tips on how glasses wearers should apply eye makeup and keep it lasting all day. Frames can cause makeup around the eye and nose area to fade quickly, so it’s always recommended you go for the longest-wearing products available. Look for phrases like waterproof and smudge-proof to guarantee you’re buying makeup that is actually going to stick around. 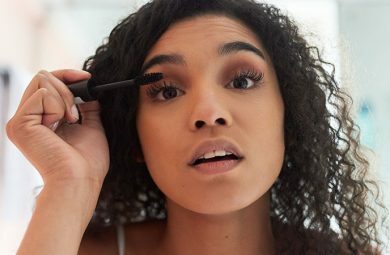 It’s pretty impossible to apply your eye makeup with your glasses still on, so you’re going to have to learn how to apply makeup without being able to perfectly see what you’re doing, which can be tricky! 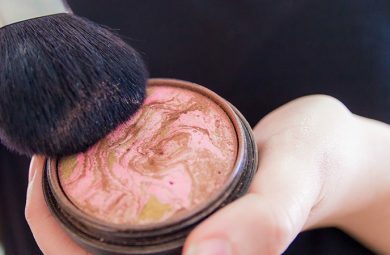 Use a magnifying mirror to help you along, and brushes with short handles to prevent you from hitting the mirror with them. Apply your makeup lightly and build up thin layers. A heavy hand and thick layers can mean having to start again which is not only a pain but will take up more of your time. Whilst some people seem to think their frames hide their dark circles, unfortunately this isn’t the case. Lenses can actually highlight any discolouration, making it appear worse. This is why it’s important not to skimp on concealer when you’re wearing glasses. 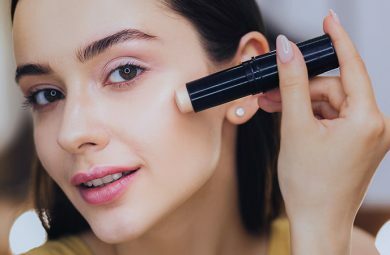 Start off by applying a peach toned corrector to counter the dark under eye circles, then apply a concealer a shade lighter than your skin tone to brighten the entire area. Blend with your finger for a flawless and smooth finish. Most noses have some natural redness to them, and if you’re taking your glasses on and off, this redness is likely to show up more. CC creams have color-correcting properties to help lightly cover any discoloration and neutralize redness. 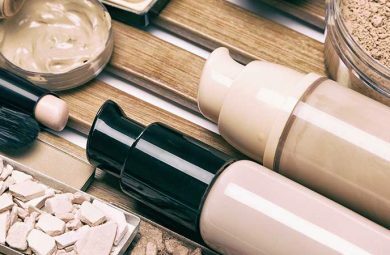 Lightweight foundation formulas such as BB creams are also best around the eye and nose area as heavy product may come off easily with the frames. Always work in light layers and then lightly blot away excess to ensure product doesn’t lift off. Setting your concealer and foundation is crucial if you want long-lasting makeup. Lightly dust a finely milled loose or pressed setting powder over the areas to ensure makeup will stay put. Your glasses will accentuate dark tones so it’s important you keep your eye area bright and fresh. Opt for light and shimmery eyeshadows to keep the attention on your eyes rather than your glasses, and avoid using really dark and heavy eye makeup. If you do want a smokey eye, choose a kohl liner instead and smoke it out. This will not only last longer but requires less precision so is much easier to achieve. If you have colored frames, using colored shadow is a playful way to keep things fun. Go a shade lighter if you’re going for a similar color to your frames to draw attention to your eyes, and if you’re going for a different color then play around with contrasting shadows. Always use a primer under your eyeshadow to keep it in place and prevent it from transferring onto your lenses. The general rule is that your eyeliner should mimic your frames. If you have black frames, equal the look with a jet black liner, but if your frames are tortoiseshell consider a soft brown instead. The thicker your frames, the thicker your eyeliner should be, whereas if you have thin frames use a softer line. Always apply eyeliner across your whole lid, and even consider a cat eye to really extend your eye shape. Mascara can seem problematic if you’re a glasses wearer. However, if you carefully curl your lashes before applying mascara, they shouldn’t touch the lenses. Consider a lash lift if you struggle with down-pointing lashes. Long wearing mascaras are crucial to prevent smudging, and on application concentrate on building volume at the root as opposed to the tips to keep your lenses mascara-free. No matter whether your frames are touching your brows, cover your brows or fall completely below them, your glasses will draw attention to them, making achieving a flawless eyebrow look even more important. Keep on top of grooming and add a subtle highlight to your brow bone for greater definition. With our long-lasting eye makeup routine, you can guarantee your specs will complement your eye makeup and make your eyes pop.